In this tutorial, we will discuss how JPA/Hibernate supports Inheritance mapping. We also look into several inheritance strategies that JPA specification provides. Relational databases don’t have a straightforward way to map class hierarchies onto database tables. 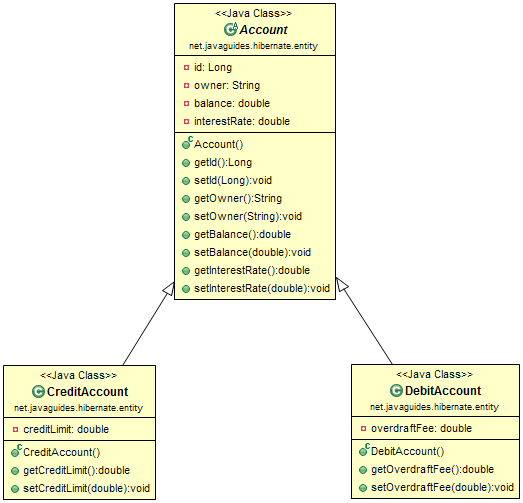 MappedSuperclass - Inheritance is implemented in the domain model only without reflecting it in the database schema. In this strategy, the parent classes can’t be entities. Single table - The domain model class hierarchy is materialized into a single table which contains entities belonging to different class types. Joined table - The base class and all the subclasses have their own database tables and fetching a subclass entity requires a join with the parent table as well. Table per class - Each subclass has its own table containing both the subclass and the base class properties. Entity inheritance means that we can use polymorphic queries for retrieving all the sub-class entities when querying for a super-class. Before get started check out Hibernate Developer Guide and Spring Hibernate Tutorials to develop J2EE enterprise applications. Since Hibernate is a JPA implementation, it contains all of the above as well as a few Hibernate-specific features related to inheritance. Let's discuss each JPA specification inheritance strategies with examples. The JPA standard specification defines the @MappedSuperclass annotation to allow an entity to inherit properties from a base class. From a database perspective, the @MappedSuperclass inheritance model is invisible since all the base class properties are simply copied to the database table mapped by the actual entity class. 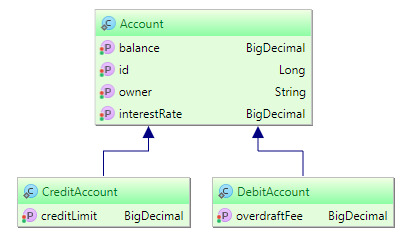 In the following domain model class hierarchy, a DebitAccount and a CreditAccount share the same Account base class. Note that when no explicit inheritance strategy is registered, Hibernate/JPA will choose the SINGLE_TABLEinheritance strategy by default. The inheritance strategy is defined on the abstract superclass, using the @Inheritance annotation. In this example, we used InheritanceType.SINGLE_TABLE. This means all concrete subclasses will be stored in one table. You can optionally specify a discriminator column name. This column is registered by the @DiscriminatorColumnif omitted the default DTYPE name is used. Let's use @Inheritance(strategy = InheritanceType.JOINED) annotation to use this strategy. In this article, we have discussed how JPA/Hibernate supports Inheritance mapping. We also looked into several inheritance strategies that JPA specification provides.